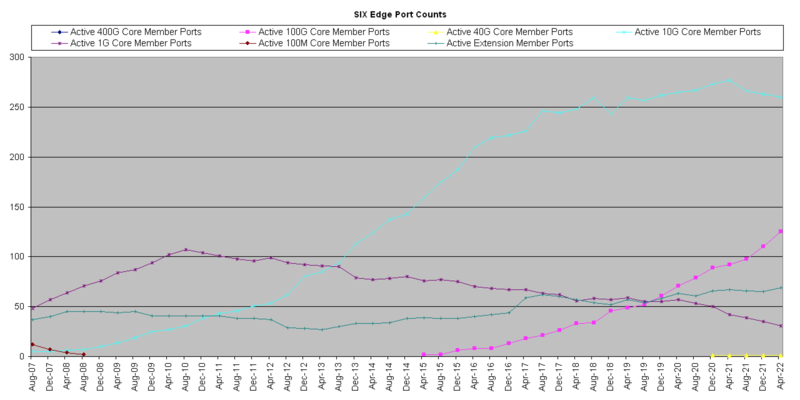 The Seattle Internet Exchange (SIX) was originally established in April 1997 as a private interconnection between two ISP's in Seattle's Westin building, whose traffic was traveling from Seattle to Texas and back just to cross from one side of the floor to the other. Starting in June 1997 other ISP's became interested in interconnecting, and the SIX became active June 20th, 1997. Networks began to participate in the SIX due to the low/no cost involved, and it began to grow. Faced with a growing number of participants and a rather ad hoc arrangement of hubs/switches and cable termination points, early members of the exchange petitioned the building for a neutral space. The building management obliged and allocated space for the SIX adjacent to the building's T1/T3 (and later fiber) meet-me rooms. This provided the SIX with a neutral, provider independent home. The SIX offers GigE, 10GbE, 40GbE, and 100GbE port options. One-time port fees are detailed on our join page. The SIX does not charge recurring fees, but they are offered as a payment option. There are no requirements of participants, other than they follow the rules of the exchange. There are no peering requirements, although peering with other members is encouraged and is basically the point of connecting to the exchange. We offer optional route servers. For information about joining the SIX, click here. Information on other exchange points can be found here. 1997-04: IXA and Wolfe form private interconnect. 1997-06: Hub added and Altopia connects. The exchange is born. 1997-11: Renumbered into Bill Manning's EP.NET IP address space. 1998-01: Petition letter given to Westin Building management requesting neutral space. 1998-05: First "national" network, AboveNet, joined the exchange. 1998-06: Replaced 10 megabit hub with a Cisco 1900 XL 10/100 switch. 1998-07: Moved out of IXA suite and into the current SIX space. 1999-02: Microsoft joined the SIX which acted as a considerable catalyst for growth. 2001-05: Incorporated as a non-profit. 2001-09: Cisco 4912G installed. First GigE ports became available. 2001-12: PAIX / SIX interconnect turned up. 2007-05: Cisco 6509 installed as the core switch. 2008-09: Received IRS section 501(c)(6) income tax exempt status. 2009-02: Activated VLAN specifically for multicast peering. 2009-07: Cisco Nexus 5020 installed for 10GbE participants. 2009-07: Renumbered into IP address space assigned by ARIN. 2009-07: 10GbE port fee lowered from $10k to $5k NRC (Non-Recurring Charge). 2011-08: Arista 7508 installed for 10GbE participants. 2011-09: Cisco Nexus 5020 retired. 2012-08: KOMO Plaza (Fisher) switch upgraded from Cisco 4912G to Extreme X670 and ISL increased from 1 Gbps to 10 Gbps. 2013-04: Began using AMS-IX's "arpsponge" software. Much appreciation to Steven Bakker, Arien Vijn and AMS-IX for sharing this brilliant technology. 2014-02: First MTU 9000 peering. 2014-08: 100GbE and 40GbE beta testing offered. 2014-09: 100GbE and 40GbE port fees introduced at $16k and $8k NRC respectively, plus optic. 2014-11: Arista 7508 upgraded to 7508E. 2014-11: Cisco Nexus 3524P switch at Sabey Intergate activated with 20 Gbps ISL to core Arista 7508E. 2015-01: 10GbE port fee lowered from $5k to $3k NRC. 2016-12: Arista 7512R installed for 1/10/100GbE participants. 2017-01: 10GbE port fee lowered from $3k to $2k NRC. 100GbE and 40GbE port fee changed from $16k and $8k NRC respectively, to $10k NRC with optic now included. 2017-08: KOMO Plaza: Extreme X670 replaced with an Arista 7280SR-48C6 and ISL increased from 10 Gbps to 300 Gbps. 2018-03: Sabey Intergate: Cisco Nexus 3524P replaced with an Arista 7280SR-48C6 and ISL increased from 20 Gbps to 300 Gbps. 2018-10: Arista 7508E upgraded to 7508R.